What are the Humanities? Are the Humanities still valuable? This presentation will explain the initial development of Humanities Councils throughout the nation and highlight ways in which the Missouri Humanities Council is working statewide to interpret, document and share the rich history and heritage of Missouri. Current initiatives of the MHC include the Show Me Missouri Speakers’ Bureau, Interpreting the Trail of Tears in Missouri, an early learning literacy program called “Read From the Start,” veterans’ writing workshops, heritage programs, public forums, exhibits, grants, and so much more! 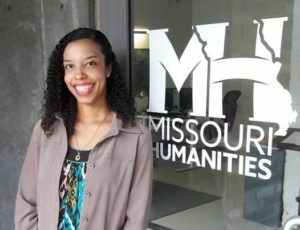 Dr. Monique Johnston is director of education at the Missouri Humanities Council, where she works to enrich lives and strengthen communities by connecting Missourians with the people, places and ideas that shape our society. Monique is a Kansas City native and has experience in program development, fundraising and partnership cultivation. With an Interdisciplinary Studies B.A. in German, Biology, and African American Studies from the University of Missouri-Columbia and an M.A. & Ph.D. in African American Studies from Temple University, Monique uses her local nonprofit work and international research experience to support statewide efforts to develop diverse cultural exhibits, lectures and symposia. Monique is also active in the Centurions Leadership Program through the KC Chamber of Commerce and is a current board member with the Heritage League of Greater Kansas City.